It is a damning indictment on our society that success rests not on how smart your child is but rather if they have a piece of paper on the wall from the right institution. It is the paper that determines your child’s future, not their intellect or achievements. A whole segment of our society thrives on the graft and delusion of being successful by way of what money buys you. The 50 people arrested yesterday in the largest admissions scandal in the history of the U.S.A., are only the tip of the iceberg. But they are emblematic of how the elite in the country think it is okay, because they are rich, for them to operate on one level while everyone else struggles. In every aspect of our society, inequality has taken hold. 99% of the population can’t make a living wage, homeless rates among full-time workers is at a record high, but at the same time the 1% get a golden parachute if they run a business into the ground or squander the savings of that other 99%. Get arrested for defrauding banks for millions of dollars? No problem. Throw cash out there and you’ll get a lighter sentence than a drug offender. After all, its a white collar crime. Now we find out if your kid knows everything about ComicCon but nothing about science or math, you can get them into the best schools, guarantee a diploma, and have them come off as Einstein to the world. Meanwhile, the person from the 99% who actually possesses the intellect to change the world for the better struggles to be accepted and pay the tuition at the local community college. The L.A. Times did a profile of all 50 people in the scandal. It is a cross-section of the business and academic elite. The two actresses who were arrested garnered the most attention only because they had the most famous faces. Truth is, the corruption runs deep. I’m sorry, if you have to spend $500,000 to get your kid into a good college, or bump their SAT scores by 40%, then maybe college isn’t for them. How about spending that money on scholarships for kids whose parents are working two shifts at Walmart? A lot of these kids had no clue what their parents were up to - which probably shows you just how dumb they are. They know they can’t pass those tests. That they’re only there because of the parent’s money and if pressed, they’d flunk out. But they don’t see that as a stain because there is such a sense of entitlement they simply think that is the way it should be. Most of these cases involved USC and UCLA. But I’m confident if you started turning over the files at other schools, you’d find the same story. No one on the street is surprised that it was happening, only in the amount of money being spent. Until the 1% are made to reckon for their actions, the system won’t change. Lets hope this is a start. The upheaval in Haiti has reached a point where something has to give. Petrol is almost impossible to obtain. Food is scarce. And while the airport is still open, roads around the capital city and into rural areas are closed. Foreigners trying to reach the airport have had to hire helicopters for the ride. But they are cutting back due to lack of fuel. *There is a lot of off-shore oil and gold that American businesses have been trying to get to for a long time. American corporations have a long history of basically looting the region. *Fighters, apparently smuggling weapons into the country, were just arrested. Westerners (including Americans) were among them. This actually speaks of really poor planning as it isn’t like Haiti has a booming covert agency of any type. Then again, since Trump became President, there has been a serious of high casualty and failed military missions. Planning isn’t exactly their strong suit. *Embassies are closed. The Americans have left. The Canadians left after 100 Canadian tourist had to be rescued from beach hotels. An American group from Flint had to be saved by Navy Seals. If you think you should travel to Haiti, think again. *The Haitian President just fired his American, French and Canadian Ambassadors. He probably thought they’d been compromised. *The Haitian President is sending a special envoy to meet with Bolton this week. Expect an ultimatum, followed by a coup. Even with a coup it will be chaotic and no one will really control the streets. All this has been since the first of the year. Coincidence? Don’t count on it. 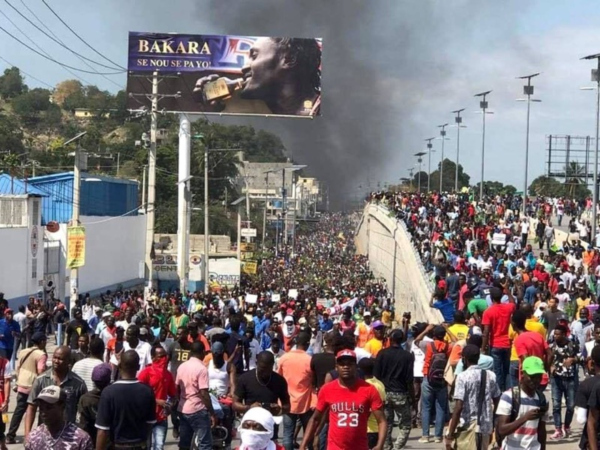 Thus, this begs the question is the Trump regime behind Haitian unrest and if so, to what end? Personally, to quote a congresswoman, I think its all about the Benjamins. The trouble with Avon LLC starts in their tagline which is as misleading as it comes, ‘A company for women’. If it reflected truth, it would read, ‘A company for women ran by men’ because if you go to their distribution center, you’ll discover almost every area supervisor is a male, while every floor leader beneath them is female. This even when the women often have been there far longer. *They closed their distribution center in California in 2018. That leaves only one for the whole country, located in Ohio. *That distribution center doesn’t field enough orders to keep its single shift working 40 hours a week this time of year. Many employees are encouraged to take unpaid time off. *Holiday sale results meant that many promotional items, like their ‘A’ boxes, had to be broken down and used as excess. *Tech and equipment is dated. There are constant jams and breakdowns. Many functions aren’t automated (in the current sense). *They rely on temp workers for much of their employee base but have trouble attracting workers since the pay was until recently, under $10 an hour. Currently, it is at $11 which is still not a livable wage. At some point, if they want to stay competitive, they’ll have to really raise them. So if you want to rely on Avon, you do so at your own peril. The health of a company can often be judged by its own internal infrastructure. And even though it imports many goods from places like China, Avon here in the States doesn’t rate too well.